The Nissan Micra is back. Although it hadn’t actually gone away. But given the anonymity of the outgoing car you’d be forgiven for thinking the Micra had disappeared. That model was hardly Nissan’s finest hour and we weren’t the only ones who went on the launch in 2010 and saw it as a backward step from its likeable and sort-of-charming precursor. So, it’s no surprise to see big changes as Nissan looks to reinvent the Micra. Gone is the soft bubble shape to be replaced by a sharp design that’s all angular pointy bits. The jury is still out as to whether it’s a looker but there’s no denying it’s the polar opposite of the old, dull-as-dishwater design. Nissan describes the Micra as ‘audacious and revolutionary’ and uses lots of words like ‘dynamic’ in its marketing. And you know how we like that. Unlike the old Micra, this model has been designed specifically for Europe. Indeed, the ride and handling were developed by Nissan in the UK, using the Ford Fiesta as a yardstick. And the results are immediately evident. Like the Micra before, it’s still easy to drive – and to park – despite the fact it’s a bit wider and longer. But now it also handles well, with nicely weighted steering that makes it reassuring and dare we say it – actually enjoyable – through corners. It’s no surprise to discover that Nissan is working on a higher performance Nismo version. The ride is on the firm side, part of Nissan’s attempt to make this Micra feel a bit more ‘sporty’. It’s comfortable enough, although doesn’t quite have that smoothness of a Volkswagen Polo. The cars we drove were fitted with big 17-inch alloy wheels, so we’d suggest sticking to a 16-inch wheel for comfort, plus they also bring better economy. The obvious comparison here is with the Clio, given the partnership between Renault and Nissan, especially as this Micra will be built by Renault in France. However, the Micra isn't based on the current Clio but uses a ‘similar’ platform according to Nissan. It also uses the same engines and gearboxes, albeit with changes made by Nissan. That’s obvious in the more positive gearchange while the steering is shared with the Qashqai. The most popular model by far will be this 0.9 IG-T, a three-cylinder turbocharged petrol with 90PS. It’s a good little engine (called TCe by Renault) with lots of low down power meaning it’s ideal for around town. It rarely feels out of puff and is surprisingly nippy too. It doesn’t quite have the character of the Fiesta 1.0 EcoBoost engine but it suits the Micra well, helped by the fact it’s very quiet with minimal vibration in the cabin, which is not always the case with three-cylinder engines. It should also prove reasonably cheap to run. The claimed average is 64.2mpg while the same engine in the Clio is showing around 45mpg with Real MPG users. Alongside this will be a standard 1.0-litre petrol (with less power) offered in entry-level trim, plus a 1.5 dCi. The diesel is impressive and economical, but it’s hard to justify the extra £1350 unless you’re covering lots of miles. Inside, the new Micra is a huge step forward. The drab interior has been replaced by something more stylish and modern. But most crucial is the quality. This is a far better finished car than before with more soft touch plastics and modern fittings. There’s also more space, particularly elbow room. There are three different interior colour schemes you can go for – as Nissan attempts to add a dash of excitement, plus on the outside you can add stripes on the bonnet, roof and down the sides if you really want to. It’s all part of giving the Micra some youth appeal. Room for those in the back is about standard for a hatchback this size, reasonable enough for kids as long as you don’t want to slide the front seats all the way back. And if you have a rear facing child car seat you’ll find room in the front very tight. But the 300-litre boot is a decent size and also deep, although this does mean you have to lift heavy things out over a substantial lip. The Micra does however come with a proper spare wheel as standard. All models – even the entry-level version - come with a colour touchscreen. It doesn’t have the sharpest of displays or the most modern of menu layouts, but it's still easy to use. The Micra also gets Apple CarPlay, although Android Auto won’t be introduced until later in 2017. The best value model looks to be the Acenta. It comes with 16-inch steel wheels (although 16-inch alloys are a no cost option), air con and the two-tone upholstery. The Micra comes with lots of safety kit too including Intelligent Lane Intervention and Intelligent Emergency Braking, the latter will automatically apply the brakes if it detects an imminent collision. Both are part of the Safety+ pack which is standard on all cars - and a first among small hatchbacks. At £14,995 the Tekna 0.9 TCe is competitive alongside the likes of the Skoda Fabia SE L 1.2 TSI, while the cheapest Micra is £11,995 - although it’s pretty basic. While the Micra name might remain, this car is totally different from before. And in a good way. It's an impressive all-rounder that's comfortable enough, handles well and is also refined. Nissan has got all the basics right - the driving position is spot on for example - while all the main controls have a solid feel. It all adds up to a hatchback that's easily a match for the best competition and with its far more distinctive look, one that leaves the drab image of the Micra behind once and for all. 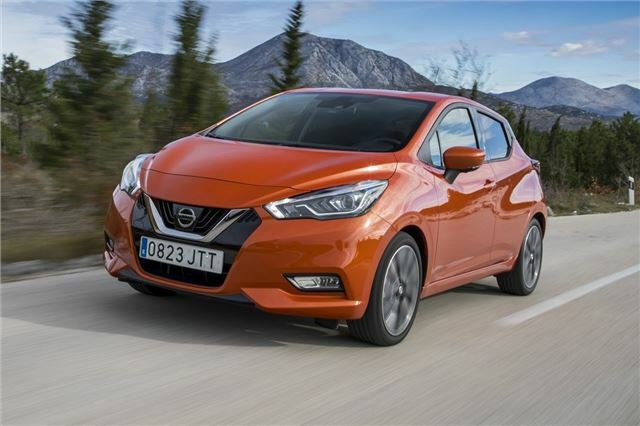 The Nissan Micra is available to order now with the first cars arriving in March.